By connecting your accounting package to Fergus, we take the hard work out of getting your customers into Fergus. Start by linking to your accounting package. If you're connected to Xero, only customers marked as 'Customers' are brought across. 'Suppliers' and other labels are not brought across to Fergus. This behaves the same way as importing your customers in the Customers screen. If you aren't connected to an accounting package or simply don't want to import them from one, you can import a file containing your customers. In this example, you can see we matched up Name to Column 1, Phone number to Column 23, and so on. 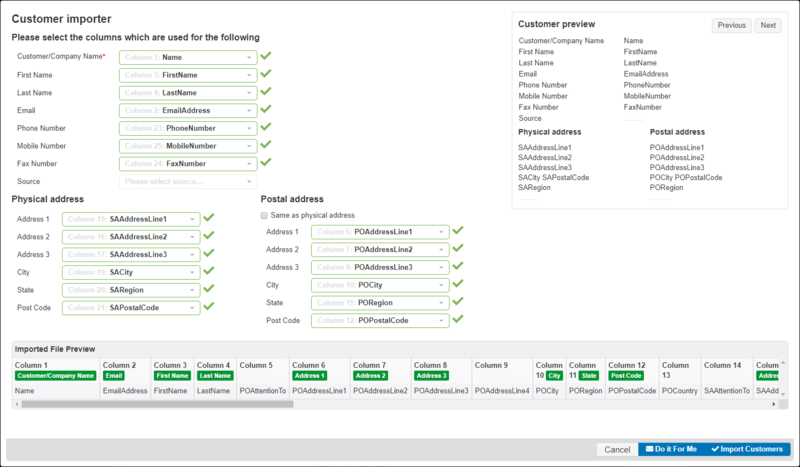 Don't worry if you make a mistake, if things look wrong you can always re-upload the customer list at any time.